LA Clutch is now available for Honda S2000 (AP1 / AP2). Based on the combination with the GTS7040, the output is estimated to 280kw (380ps), and the capable torque is 450N・m (46kgf・m). Use the LA Clutch for S2000 in a wide variety of driving conditions. 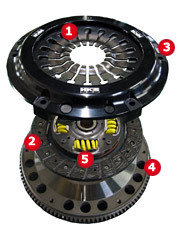 HKS LA Clutch provides remarkable capability and advantages as a high performance single clutch. Clutch performance is enhanced with appropriate balance between its capable torque, light weight, and controllability. No uncomfortable feeling after installing this clutch to NA vehicles. Enhanced pressure bonding for remarkable high capability. Tight clutch operation is maintained at the same time. "MG Composite Disc" is composite of Metal fiber and Glass fiber. This unique disc has ideal performance of friction coefficient , anti-heat and strength. For street driving, clutch engagement is very smooth. For circuit driving, it engages quickly without slippage. The low inertia disc protects synchronizer and accepts quick gear change. Clutch cover has Strap Drive Mechanism that provides reliable clutch disconnection. The optimized lightweight flywheel enables the smooth and balanced clutch engagement which stimulates quick response and acceleration. Lightweight drilled type flywheel reduces inertia. Disc Damper eliminates the uncomfortable gear noise from transmission. It absorbs the shock torque and protects the drive train. Allowable Range is the range of engine torque that the clutch can be used except intentional overheating of clutch. Conditional Allowable Range is the range that clutch slippage may occur by rough operation, kick back from tire and distortion of parts etc. Over the limitation is the range that the clutch slippage may occur during clutch engagement at high rpm. Physical limitation is the point that slippage may occur during acceleration. *1 Pedal effort was measured during actual driving. There may be a difference depending on a vehicle's specification.